The way that we utilize data can make all of the difference when it comes to sales. It’s more important to make quality connections and have meaningful conversations with prospects than to contact a large quantity of prospects on a superficial level. Utilizing data in the right way can help you make those quality connections. Today’s guest is Matt Amundson, the VP of marketing for EverString. 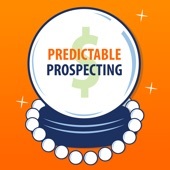 Listen to today’s episode to learn more about what EverString does and what Matt has to say about how data can be used to help prospectors learn more about their prospects and make conversations more meaningful. Marylou: Hi everybody! It’s Marylou Tyler. This week’s guest is Matt Amundson. I knew I was going to mess that up but Amundson just like Anderson. He’s the VP of marketing for a company called EverString. The reason I have asked Matt to come on the show today was because I was very intrigued by what they’re doing over there—over at EverString in terms of the list. Now, you guys all know that I harp on the list. I don’t like the fact that we’re still blitzing, still mass mailing people, emailing, in the hopes of finding the cherries, the low-hanging fruit. We have to change this. I’m going to let Matt take the stage away and talk all about it but really, what’s happening here folks is that we are trying to reach the era of quality and stop worrying about the quantity of things because it’s not helping us. Our response rates are going down, our delivery rates are going down, we’re getting a lot of people who are savvy to these mass mailers. So really, it’s about us thinking, “Who are these people who we can do business with, who want to do business with us, and what can we find out about them?” so that initial conversation is more meaningful and resonates with them. Matt, I would like you take it away from here. Tell us about what you guys are doing there and how this is impacting our industry for the better. It’s not replacing the development people, the sales development folks, it’s augmenting them and making us appear smarter, more concerned, and better salespeople because we can focus on the conversation finally. Matt: Well, thank you for that awesome introduction, Marylou. It is an absolute pleasure and a privilege to be on your show. I was a huge fan and literal disciple of your book that you put out with Aaron Ross, Unpredictable Revenue. I read Predictable Prospecting and loved it, so this is an absolute treat for me today. Matt: Just kind of the nutshell here on EverString. EverString, we consider ourselves a modern data platform. The term modern gets thrown a lot and I’ll sort of unpack what that means to the team here. Modern in the way that we collect and curate data, and modern in the types of data that we deliver. When I say modern in the way that we select and curate data, a lot of legacy data providers use very traditional means of collecting data. They use call centers—whether domestic or offshore—to essentially call on businesses and try to figure out the firmographic or technographic data on those companies and they bring it into their database. The unfortunate thing about that is when they don’t connect with that company, that data just stays stagnant, it doesn’t get updated. What a lot of people see from the list from these legacy data providers is just really outdated data. The way EverString approaches it is we blend human beings with machine learning, so we’re actually able to have some human interaction with some companies we collect data. But then also, we use a machine to say, “Okay, this person collected data in this way, I can go do this out of scale.” Then we feed that data back to a person for verification. What we get is really up-to-date data that’s then curated by human being which is a much smarter and more scalable way of collecting data. It’s allowed us to catch up with a lot of the legacy data vendors in terms of the coverage of data that we’re able to provide our customers. When I say modern from the perspective of new types of data, because we […] data science and machine learning into the data, we’re able to figure out connections that are just between businesses. What that enables an SPR or salesperson to view is to see things like, “Oh, this prospect or this account looks a lot like these three customers that we have.” Or, “This company looks a lot like these companies that are growing so it has a high-propensity to buy or perhaps it has a high-propensity to need a round of funding.” Or for some of our financial services customers, “This company may be a high-risk for credit or low-risk for credit.” We’re able to not just look at data in the form of fields inside a Salesforce record but how do we pull that all together and use machines to help us extract the insights that we probably normally could get as a person but on a massive scale. Marylou: To what extent does the company who engages with your company have to have their data act together or could we have the typical dirty database that made an effort to put the fields together and not have duplicates but it’s not the way we want. Is it okay if our data is not pristine to run through an engine like yours to come out with quality? Or do we need to come in with quality as well? Matt: I’m so glad you asked that question. That’s something that comes up a lot. It really doesn’t matter how clean or dirty your database is. All we really need to have an understanding of is, are the account that exist in your database, are they at an opportunity level, are they at a deal level, are they at a customer level, etc. We don’t ingest any of the firmographic data or whether you have multiples of an account or of a contact. It’s our database. We’re bringing our own fresh clean of data to you. It’s less of a pull and more of a push. The only thing that we’re pulling out is which ones are customers and which ones are still just a prospect to you. Marylou: …yeah. We could do the best we can at all—is it all the pipeline? Because top-of-funnel especially in a Salesforce instance, we don’t necessarily have the stages defined, we have to sort of […] fit it to get that coworking qualifying stage. But definitely from opportunity down, there has been a lot of emphasis about keeping track of where things are, relative position, how long they’ve been there. Do you also take in that time parameter to help understand the slow medium and long time to sales conversion rates and things or do you get some gist of days and stage is what I’m asking you? Is there some level of us being able to provide that or do you glean that out so that we know our tiers of accounts and how long things take to actually close? Matt: Yeah, great question. Some of our most advanced customers are using EverString to build models around fastest wins. If they’re feeling confident about their data, about when an opportunity was created up until when an opportunity was closed one, then we can certainly ingest that data and build models about that looks somewhat like that. When I say model, what I mean by that is, if you had say, 10, 15, 20, 100 accounts where you had an understanding that, “Hey, this is quality. I want to see more just like this.” We can take that, understand all the components that make that account a good fit and go look for similarities. Marylou: Oh, interesting. Because a lot of times we have to fake it ‘til we make it and just start with what we think is a good baseline and then go out—I guess, bottom-up would be the best way to describe it—and then dispute it or rejoice in it, one or the other. Because we think we’re on the right track but then we start actually doing these campaigns and these touches and seeing how long things take, with mindfulness now instead of willy-nilly, we still maybe off with that. But at least it gives us a good starting point of, “Do we have tiers, first of all, of accounts? Do they close with different conversation rates? Can we have a nice and ebb and flow type of forecast that’s not pigs and valleys because we fed it with enough of these different accounts that had these different cycles and yields, so that our forecast looks really good.” Have you seen that with the way that your company works, by feeding us better data to have better conversations, that our forecasts are now looking a lot better and a lot more impactful and actually meaningful? Matt: Well, there’s two things that I would say with that. EverString is not necessarily a platform that you would use to say, “Hey, what’s the quality of this opportunity? How likely is it to close?” But there are two things that I found over the course of my career that are the primary blockers to why meetings don’t turn into opportunities. A lot of it has to do with the relationship that exist between sales development and sales or marketing and sales which is sort of however you want to carve up those three groups. Matt: One is that the company is not a good fit. I always give the broadest possible explanation for why a company is not a good fit. Say you are Marketo in 2012. In those days Marketo could only sell to companies that were running Salesforce as their CRM. If your SPR brings an AE, a leads from an account that’s running from say Microsoft Dynamics or SugarCRM as their CRM, that’s going to be not a fit. Right? Matt: The second thing that causes a meeting not to turn into an opportunity is the element of timing. It might be the right business but the timing maybe off. There’s two ways that we save those two issues off. One, we create models to give you a concept of fit. “How much does this look like one of your existing customers?” and that includes hard filters like it has to have Salesforce CRM or maybe it has to be using Google Analytics etc., or it maybe it has to be of a certain size or number of employees. And then the second thing is we […] intent saying that, “Hey, this company is actually doing active research for this specific product or service.” And so, as an SPR, when you’re able to bring an AE, an account that looks exactly like 10, 12, 15 of your customers and is actually looking for a solution or a service like what you sell right now, the conversion rate from meeting to opportunity just shoots through the roof. While we may not be necessarily be impacting speed in opportunity to close through some sort of AI that’s telling you, “Hey, this is good.” Or, “You should be doing other things.” The quality of the opportunities that are coming into the latter stage of your funnel should be significantly higher because you’re only dealing with accounts that are a great fit with your business and are actively looking for a solution like yours. Marylou: …right or wrong, if we know or think we know that they want to talk to us–it’s that whole thing that are like inbound versus outbound. When people are coming into us, coming into our net, we have this sense of, “Well, they want to talk to me.” Whereas when you’re going outreach call, they feel like you’re bothering them. I would imagine this really helps not only with the velocity but helps with the way that we actually engage in that conversation because we feel better about it, because we think we know that they’re looking; they’re actively researching, the timing is right. The hand-off like you were talking about before still remains a monumental problem out there in the world, but I know you guys can help us with that. But getting the information in the hands of the reps in a timely fashion is really where this all just opens up for a higher converting sales pipeline, I would imagine. Marylou: Right. But like you said, in Predictable Revenue, we talked a lot about the mapping call which is navigating through the organization in the hopes to start assembling the right people. While it’s fun, it’s time-consuming task but what you’re doing is you’re advancing that sales conversation to the point where the points of differentiation have to be really honed by the teams. The ability to have a persuasive sales argument really starts to show. What this is doing, what I think is great about this whole AI deep learning, it’s forcing us to be better in the sales conversation, focusing on our sales skills instead of running around admin trying to figure out, “Well, where are these people?” You know where they are, you’ve got them, they’re interested and now it’s up to you Mister and Misses salesperson in order to be able to convince them that you’re the right fit. My colleague Keenan just wrote a book called Gap Selling, really finding that gap of what they have today, what they can experience, and why you’re different from the competition. If we can focus more on that we’re going to get better at it just by nature of the fact that we’re having more conversations. Awesome. Matt: Yeah, absolutely. I think you’re hitting the nail on the head. This is the one thing that as a marketer, I’m very much a proponent of how we up-level the sales game and how do we get away from just the, “Oh hey, you’re a marketer and you need this.” And more into, “Hey, I have an understanding of what’s going on in your business. I understand the challenges that you’re going through.” and then tailoring their offering towards that. If you’re a salesperson, you’re going to talk to me that way, I’m so much more likely to buy from you. Marylou: Exactly. What we’re trying to get to which is that consummate professional who is there as a guide to help them weave through all this crazy information to get to the end of where they want to go. Like, “Where do you want to go? Where do you see yourself?” They now need to prove that we’re the ones that can take you along that success path from where you are today to where you can ultimately be. I’d love that. The other thing I’m hearing too, Matt, is perhaps not only sales skills but mindset and habit and repetition and discipline—all the things that make it difficult for us because we multitask so much, this focuses us in on that human interaction, building the empathy, more of a human-to-human interface results with the help of technology. Do you agree with that? Do you think technology is more of an aid rather than a replacement in this case? Marylou: Definitely. Getting to this next step, I’m sure people are sitting here—probably driving home right now—but I’m sure they’re thinking, “How does one get started? Is it as simple as going through your historical information, kind of mapping through who are my client types and giving enough information so that we can model?” or is it like, “Here’s what I’ve, go figure it out since there’s a lot of data in the data set that you could probably piece together.” How do you usually set this up? Is it part human telling you the story as well as the data or can you do this figuring out the initial architecture from the data itself? Matt: Yeah, good question. It’s really both because the thing is, there’s always some sort of tribal knowledge or inherent bias that is just within a business around the types of businesses that they want to sell to. Sure, we could probably just extract the data. We could probably then separate that into all their various ITPs, build an entire total address of markets for them, there’s only hard filters that are sort of hard to glean just from raw data itself. A lot of that has to with what we talked about earlier in the call that internal data climb limits isn’t always there or the factors that make something good versus bad can’t be captured inside CRM. Companies like that tend to just spend a little bit more money on brand and those brands had always, when you work with a branding agency, they would bring you back a two-color logo as opposed to just the one. Now, that could have been tins and shades, right? It could have been like blacks, whites, and grays, but it was true over and over again. I don’t know if it just became a self-fulfilling prophecy where SPRs in our business, we’re like, “Oh, one-color logo, I’m not passing that to a sales rep.” But it was shocking how true it was. These are the types of things that are the tribal knowledge or the anecdotal evidence that creates a sales bias. Those are the things that we need to know about however crazy they might seem because shockingly enough when I talk to our data scientist here, they’re like, “Oh well, we could pull if a company has two colors in their logo or not.” I’m always surprised by what our capabilities are. But those are the things where it’s not just, “Hey, let’s look at a group of customers,” and we’ll find all the patterns that exist and recommend that, “Hey, if you like these 10 here’s the next 100 to go after.” But there has to be some sort of hard filters that go into place like I talked about earlier. Marylou: This brings you back to the days when we used to direct mail where we looked at heuristic, we looked at psychographics information, demographics, you name it. We overlaid as much as possible with the idea of segmentation. Getting down to that dataset that was the smallest dataset with the highest quality was the goal because it cost money to mail. We couldn’t really mass mail although a lot of people did. We did as much as we could to try to fine tune that. The other thing I like about this is bias in itself is a kind of an interesting parameter and metric because it could also dispel what the C-suite thing is the right account. If we go into the database and the heuristics and the characteristics of this particular best-case scenario for closed one, looks slightly different with them than with the C-suite had in mind. It’s an interesting topic to discuss. What made you think that? Matt: Yeah. The other thing too is I think, a helpful advice to any marketer that’s thinking about bringing in anything whether it’s a new data source or whether it’s a new piece of martech stack, is if that purchase is going to interact with the sales team in any way, shape or form, they need to at least play some part in the purchase or the enablement process. Because I think as marketers, just because the martech stacks have become so big we’re constantly bringing something in and adding it and then it just kind of shows up in front of a sales person whether it’s in the form of an email or an alert or an object that lives inside a Salesforce. For them to feel comfortable with it and to feel like they are a part of that process, they have to be engaged. If you just show up one day and say, “Here’s a number…” and this number is on a scale of 1-100 and then it says, “This company is an 80. This company is a 60.” They’re going to be like, “Well, actually I think that 60 is an 80. I think this 80 is a 30.” They need to be involved. If they feel comfortable with those numbers that are coming through, then they’re going to engage with it so much more and the process starts to flow a lot better. Again, getting into the psychology of it, if you feel you have some ownership of it you want it to work. If you feel like it’s just some new thing that’s been pushed into your CRM and you now have to “deal” with it, then you mentally start to self-sabotage a little bit and say, “Yeah, you said this was good. Well, it turns it out it was terrible.” If that starts to spread in the sales team then no one’s going to want to use it. Marylou: Hence the compliance issues we’re already experiencing with a lot of the technology stack that’s being put into the CRM or are bolted onto the CRMs is that there hasn’t been a buy-in from the people who are going to use it. That’s the age of software service or just software in general usages. The end users are not involved in either the design process, implementation process or how they’re going to set it up to execute it. Chances are, you’re going to be fighting a battle when this thing deploys which is not it was intended to do but that’s what happens. Matt, how do we get a hold of you going forward if we want to explore this? What is this called now? Is this data science? Is there a term for what you guys are doing? Have you invented any term yet for this? Matt: Well, you know the thing about our space is we’re sort of borne out of this idea of predictive analytics or predictive marketing. We realized that a lot of what you are talking about beginning of the call, hey, if we’re just injecting people data and trying to build models off it, more people will have massive data hygiene issues, and for the models that you build aren’t very good. About three years ago, we had to pivot into being really a data platform first that applied data science. The category that we’re leaning into as a business is a modern data platform. Getting out of the age of software that we’ve talked about at the opening of this podcast and into something that not just data but also insight; not just present day but gives you the potential future state of the business. Modern data platform is what we’re called. If you want to learn more about it, you can swing by eversting.com. I’m also a person who loves chatting with peers or people who are making their first transition into management or are interested in this type of stuff, so you can follow me on Twitter, I’m at mattya66. You can email me directly at EverString, I’m matt@everstring.com. I’m probably in ZoomInfo, DiscoverOrg and every other database, so my email is there and that’s what it is or feel free to connect with me on LinkedIn. I love interacting with people and answering any questions that they have. I’m no a salesperson so we can just have a grownup conversation whenever you’d like. Marylou: Yeah, this is really the way to ebb the future, I think. I’m really excited about the blend of the science, but also the human side, and also how we search on the internet, how we utilize data, download data on the internet. I think at the culmination of all of that allows us to reach that ultimate goal that we’ve been trying to reach which is to be in a situation where we’re actually in sales conversations a lot more of the day than we are doing administrative work or looking for stuff or researching stuff. This allows us to really fine tune our craft which is what we are hired for which is to create outcomes more predictably so that our revenues spike. I’m all for it. I think it’s the greatest thing ever. Marylou: …so that people could reach out. Really love what you’re doing and wish you a very happy holiday as well. We’re at the end of the year 2018 doing this broadcast. Matt: And you as well. It was a real pleasure to be on. This looks like a milestone for me, so I’m just giddy over here. Marylou: Well, thank you very much.